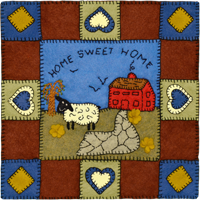 Our quilt squares are made in the applique style out of wool felt. They can be used to make a nice warm quilt, a decorative pillow or wall hanging or a table decoration. Each square has a backing of two layers of felt that measure 16″ × 16″. The central design is an 113⁄4″ × 113⁄4″ applique. Each kit consists of precision cut wool felt parts and backings, floss, needle, and instructions. To make a pillow, you will need a 14″ × 14″ preform. To make a quilt, we have left an ample 1″ of selvage on all edges of the black felt.